Kenney Jones of The Faces spoke with Noise11.com's Paul Cashmere to talk about the history of the band. Engelbert Humperdinck will tour Australia in October and November and called it to say how much he is looking forward to his Australian tour. 2013 marks the 50th anniversary of Australia’s legendary The Seekers. Richard O’Brien is the creator of the Rocky Horror Show and played Riff-Raff in the Rocky Horror Picture Show. Way of the Eagle is the contemporary music outlet for producer/composer Jan Skubiszewski, who previously worked under the name Jackson Jackson with Harry James Angus of The Cat Empire. Richard Clapton is one of Australia’s greatest songwriters. Over the past 40 years Richard has written and recorded songs now part of the Australian soundtrack. Justin Townes Earle is equal parts storyteller and singer. For his 5th and 6th albums ‘Single Mothers’ and ‘Absent Fathers’ he focused on his own story. Going outside the You Am I comfort zone is nothing unusual for Tim Rogers. To fill his ‘Soul’ void Tim has attracted himself to The Bamboos, Lance Ferguson’s 15 year-old Melbourne funk/soul band. Out front of the music industry you find the stars. Behind the scenes you will discover the legends. David Vodika founded Rubber Records out of his bedroom in 1989. 25 years later, the label lays claim to origins of some of the most innovative Melbourne produced music. All Time Low are now six albums deep into their career with the release of ‘Future Hearts’. Judith Durham is one of Australia’s greatest and most successful performers. Tony Romeril’s ‘Will You Remember Me – A Tribute To Ted Mulry’ was a labour of love. Jamie Lawson is an exceptionally emotional singer songwriter who came to the attention of many music fans via Ed Sheeran. Martin Foley, Victoria’s Minister for Creative Services in the Andrews’ Labor Government, has unveiled the Music Works funding package. In Benjamin Statler’s movie ‘Soaked In Bleach’ the question raised is ‘was Kurt Cobain murdered?”. The legendary Brian Cadd has excelled as a songwriter, producer and performer and over a 40 year career become an Icon of Australian Music. Melbourne’s British India has now clocked up a first decade together and in that time has delivered five studio albums. Paulini’s ‘Come Alive’ album comes nearly nine years after her previous album ‘Superwoman’ in 2006. 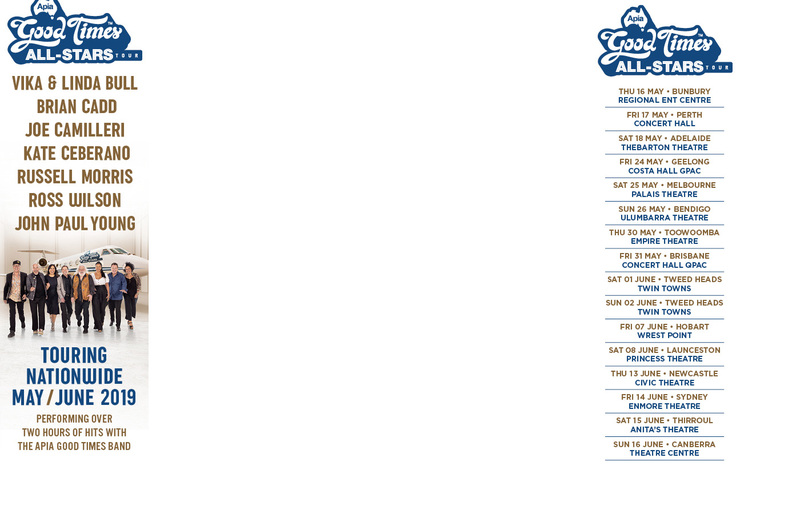 The APIA Good Times tour 2015 features Joe Camilleri, Kate Ceberano, Glenn Shorrock and Brian Cadd. Millencolin returned to the studio after a seven year gap to create ‘True Brew’, their 7th studio album. Reggie Watts is that rare beast of part comedian, part musician.